The residents of Burgess Avenue off Gainsborough Road pay pretty hefty premiums due to some of the properties backing on to the old river bed, clearly a case of the insurance companies basing their calculations from studying old maps. 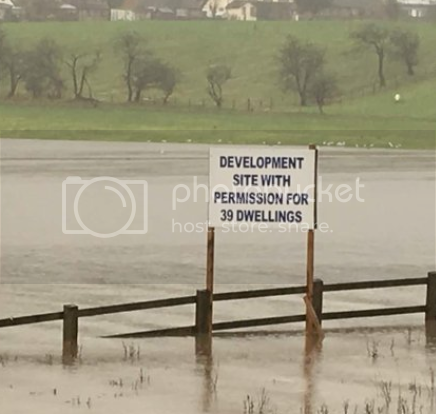 I would think there is little or no chance of water levels rising to the level of their homes!. Looks like screwed up baking foil to me. If you are paying 15% more year on year you need your bumps feeling. If 20 years ago your annual premium was £100 and it went up 15% per annum as you claim that would now be at over £1600 per annum. Are you sure it's gone up as much as you claim? If so you are being raped by your insurance company. Well I think it was 20 pounds in 1996. Just been reading an article Obs that stated individual properties would be entitled to about £5 & a half k......£500 temporary accommodation costs & £5000 for household flood defences & raising electrical sockets. On a wider end of days/global warming matter, it seems that Carlisle has been prone to serious flooding since 1700 ,which could be before pollution took hold of our climate. On the other hand these meagre government handouts are dwarfed by the £57+ million the government are shelling out to fund an enquiry into weather Iraqi POWs ,possibly terrorists, were abused by our troops whilst in detention....and that is before any compo is handed out !